Halifax BII JB842 crashed in the Fehmarn Belt 30/3-1943. The aircraft belonged to RAF 77 Sqn. Bomber Command and was coded KN-E. It is believed that JB842 was attacked by a night fighter and crashed into Fehmarn Belt not far from the German coast killing all on board. Pilot F/S Charles H. Newman, Navigator F/O John R. Armstrong, Navigator/ Air Bomber F/O Anthony Metcalf and Air Gnr F/S Ronald Brough rests in the 1939-1945 War Cemetery in Berlin while Air Gnr. Sgt Edwin S. Bowen and Wop F/S Archibald F. Smith have no known graves and are commemorated on the Runnymede Memorial. On 8/6 the body of Flt. Engr. 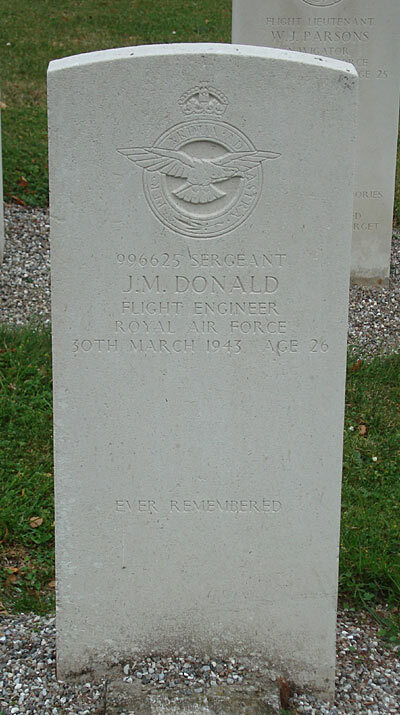 Sgt James M. Donald was found in the Store Belt at Albuen near Halskov and was laid to rest in Svinø cemetery on 12/6-1943. Sources: BCL, UA, CWGC, BS.